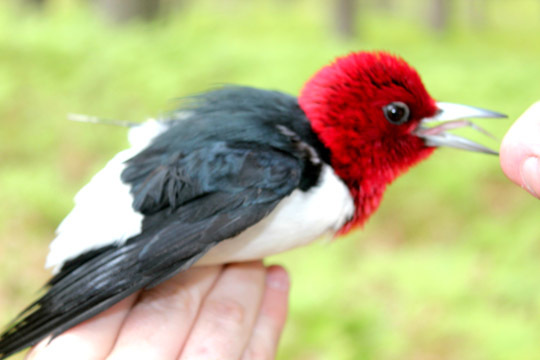 The red-headed woodpecker’s feisty, loud personality fits the reputation of crimson-maned creatures, but the student researcher gently holding the bird bucked the trend. 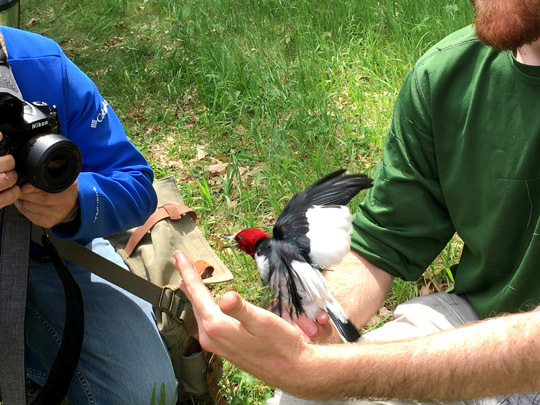 University of Toledo graduate student Kyle Pagel was calm, steady and methodical as he banded the woodpecker’s legs with tiny, colorful identifying rings and looped a miniature backpack armed with a light-level geolocator and pinpoint-GPS around its legs. 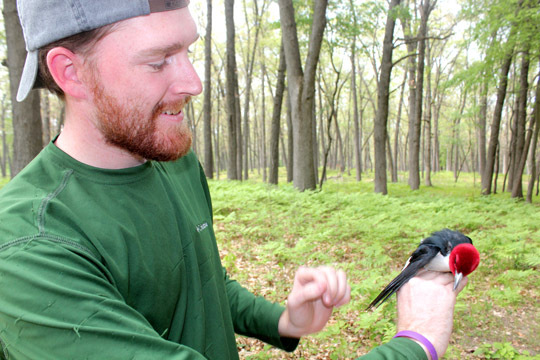 UT graduate student Kyle Pagel held a red-headed woodpecker at Oak Openings Metropark in Swanton, Ohio. He is helping to conduct research on the bird to discover migration routes and why the species is in decline. The bird that flies freely once again from tree to tree isn’t the scarlet-mohawked woodpecker regularly spotted in backyards. The red-headed woodpecker is about the size of a robin or 10 times larger than a warbler. This 70-gram, boldly patterned “flying checkerboard” is the seventh bird of its kind in a week that the UT team has examined at Oak Openings Metropark, taken a blood sample from, and outfitted with tracking technology to identify migration routes. A photographer with the media took a photo of a red-headed woodpecker held by UT graduate student Kyle Pagel at Oak Openings Metropark. Pagel, along with Dr. Henry Streby, UT assistant professor of environmental sciences and ornithologist, launched a study this month of red-headed woodpeckers that could last up to 10 years and solve many mysteries about the species. For the next several weeks, the birding team’s office will be located throughout the Oak Openings region, including sites along Girdham Road and Jeffers Road at Oak Openings Metropark in Swanton, Ohio. They expect this year to put tracking technology on 20 adult red-headed woodpeckers in Ohio and 20 in Minnesota, and on another 25 juveniles in each of those states. 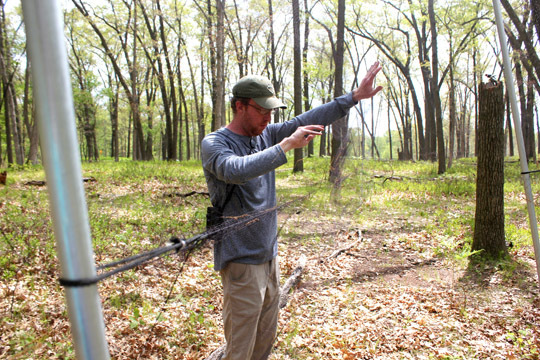 At Oak Openings Metropark, Dr. Henry Streby set up a mist net used to gently collect red-headed woodpeckers so more can be learned about the vanishing species. Every morning the team sets up mist nets and uses recorded calls, drums and decoy birds to attract the woodpeckers. Researchers are using blood samples to analyze DNA and hormones, as well as measure stress, immune system condition and aging. The miniature backpack weighs about two grams and uses a light-level geolocator to gather data about when the birds go in and out of tree cavities each day. Pinpoint GPS, like on a cell phone, will tell the researchers where the birds traveled. Food availability, specifically acorns, is one of the factors being observed at Oak Openings this season, as well as reproductive success and genetics. Streby also has been studying golden-winged warblers for five years using light-level geolocators that weigh less than half a paper clip to track migration patterns. The songbirds, which are about the size of a ping-pong ball, travel thousands of miles once they leave their spring and summer nesting grounds. The mitigating rate is a portion of the employer contributions paid by university employers on behalf of their employees who have chosen not to join the Ohio Public Employees Retirement System (OPERS) or State Teachers Retirement System (STRS), and is intended to offset the financial impact of the loss of their contributions. The OPERS mitigating rate has remained unchanged since 2009. This rate will increase July 1 and will apply to all OPERS/ARP participants. STRS recently announced the mitigating rate for the ARP, and STRS Defined Contribution Plan (STRS-DC) will decrease from 4.5 percent to 4.47 percent effective July 1. The mitigating rate reflects university contributions that are directed to STRS instead of the ARP or STRS-DC in order to offset the negative impact to STRS funding liabilities created by the existence of the ARP and STRS-DC. As a result of this decrease, contributions to the ARP and STRS-DC for participants will increase by 0.03 percent. Ohio House Bill 520 established a formula for calculating the percentage of an ARP participant’s compensation, funded by the employer contributions, which must be paid to OPERS or STRS by a college or university. The ARP mitigating contribution rate applies only to contributions effective with the ARP election, not to any OPERS or STRS balances transferred to an ARP vendor. Refunds of ARP mitigating contributions submitted in error will appear as a credit on your ARP employer account summary; they will not be refunded in the form of a check. Once an ARP is selected, it is irrevocable while an employee remains employed with the same college or university. If an employee changes employers or there is a one-year break in service and they return to the same college or university, employees have the opportunity to select OPERS or STRS membership. Questions about the new mitigating rate and ARP should be directed to OPERS at 800.777.7377 or STRS at 888.227.7877. A civil and environmental engineer with a focus on design and construction innovation and safety will join The University of Toledo as the leader of the College of Engineering effective Aug. 1. Dr. Michael Toole comes to UT from Bucknell University in Pennsylvania. Over his 18 years at Bucknell, he served as professor of civil and environmental engineering, associate dean of engineering, director of the Grand Challenge Scholars Program, and director of the Institute for Leadership in Technology and Management. During the current academic year, Toole has been a faculty fellow associated with the Partnership for Achieving Construction Excellence at Pennsylvania State University’s Department of Architectural Engineering. 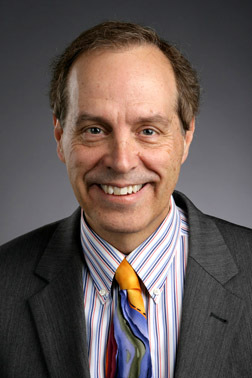 Prior to Bucknell University, Toole worked at Packer Engineering as director of construction systems and vice president of HomeCAD; Ryland Homes as purchasing and construction services manager; Tonyan Composites Corp. as president and co-founder; Massachusetts Institute of Technology as an instructor of business and technology strategy; Brown and Root Services Corp. as project manager; and the U.S. Navy Civil Engineer Corps as assistant resident officer in charge of construction and company commander in a SEABEE battalion. Toole earned a PhD in technology strategy and a master’s in civil engineering from the Massachusetts Institute of Technology. He has a bachelor’s degree in civil engineering from Bucknell University. Toole is a fellow of the American Society of Civil Engineers and a member of the National Academy of Engineering Grand Challenge Scholars Program Steering Committee, the American Society of Safety Engineers and the American Society of Engineering Education. Toole won teaching awards at MIT and Bucknell and received two best paper awards from the American Society of Civil Engineers. Dr. Mychail Scheramic started his new position as director of the University Counseling Center last month. “Dr. Scheramic brings over 20 years of counseling and leadership experience to his new role at UT,” Dr. Kaye M. Patten, senior vice president for student affairs, said. 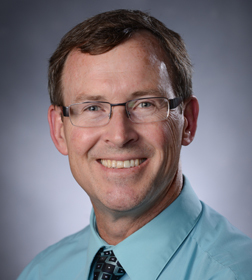 His experience includes inpatient and outpatient therapy, and supervision of counselors, graduate students and interns through an American Psychology Association-accredited internship consortium. Previously, he worked as chief executive officer at the Northwest Ohio Psychiatric Hospital, where he was responsible for the administration of mental health/clinical programs and the development and management of innovative counseling techniques serving a diverse population of clients. Scheramic has numerous publications to his credit that address critical issues in areas of behavior management and counseling. The Toledo native received an MBA from UT, and master of arts and doctoral degree from the Forrest Institute of Professional Psychology, Wheeling, Ill.
On Monday, June 5, The University of Toledo’s Main Campus Pharmacy will begin its summer hours. 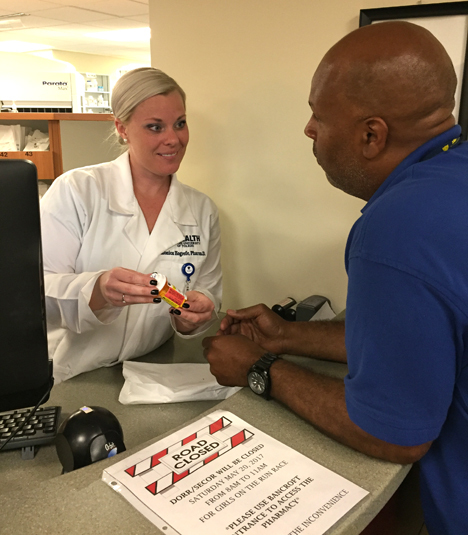 The pharmacy will be open Monday through Friday from 7:30 a.m. to 5:30 p.m. and Saturday from 9 a.m. to 2 p.m.
Pharmacist Monica Hogrefe talked to a customer at the Main Campus Pharmacy. The summer hours will remain in effect until Monday, Aug. 21, one week prior to the start of fall semester. Located in the Main Campus Medical Center across from the Horton International House, the pharmacy offers personalized health care, immunization services, affordable prices and a wide array of over-the-counter products. She added that the pharmacy will be closed Tuesday, July 4, for Independence Day. The University of Toledo Department of Music will host several summer music workshops. Workshops are available in jazz, flute, voice, and choral conducting and teaching, with tracks available for multiple ages and skill levels. All the workshops listed below will be held in the Center for Performing Arts. The UT Summer Jazz Institute is the place where all levels of jazz students from beginning through professional can discover and achieve their jazz potential through the study of jazz in one of four programs: instrumental jazz, vocal jazz, teacher training and jazz appreciation. The curriculum is designed to provide introductory, fundamental, intermediate and advanced jazz experiences for interested students from middle school through high school, undergraduate and graduate college students. There also is a pedagogy track for educators desiring to refine and develop their teaching skills. A track for those who want to grow in their appreciation of jazz also is available. The institute provides a learning environment through lectures, master classes, jam sessions, performances and a recording experience. 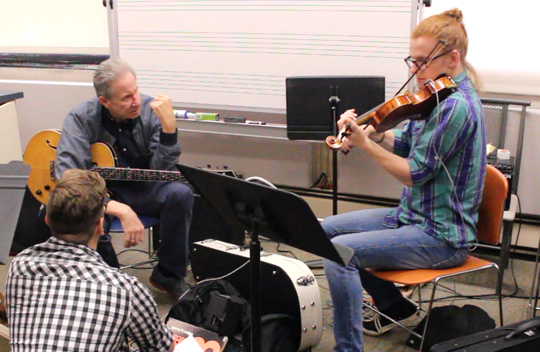 Participants immerse themselves in improvisation, performance, arranging, and pedagogy with established professional jazz musician/educators. Tuition is $500 ($50 application fee, $450 camp fee). Register online at summerjazz.utoledo.edu. Deadline to register is June 1; all fees due by June 9. 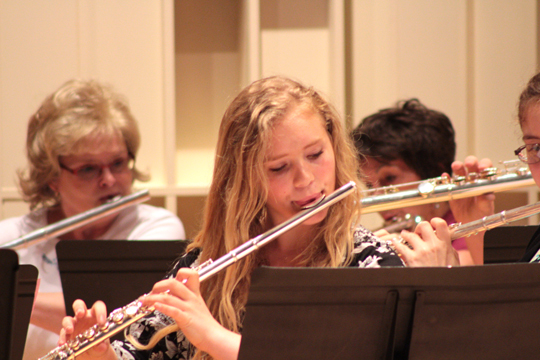 The UT Flute Camp is taught by musicians Joel Tse, principal flute for the Toledo Symphony Orchestra and UT flute instructor, and Amy Heritage, second flute with the Toledo Symphony Orchestra and Suzuki flute instructor. It is suitable for elementary age students through adults. Special guests will present on instrument care, yoga and breathing, music and movement, and more. These extras are included in the track fees. A free, public concert performed by students will conclude the workshop on Friday, June 23, at 4 p.m.
Track 1 is for students who have been playing for one to three years. It runs from 9 a.m. to noon and is taught by Heritage. The cost for Track 1 is $150. Fees are due by the first day of the workshop. Track 2 is for intermediate and advanced students and will run from 10 a.m. to 5 p.m. This track is taught by Tse and Heritage. Track 2 is $300. Fees are due by the first day of the workshop. Can’t attend all week? Sign up by the day. The cost is $65 per day for any track if attending less than the full week. Scholarships also are available to help cover fees; apply when you register. To register or for more information, visit utoledo.edu/al/svpa/music/communitymusic/flutecamp.html. 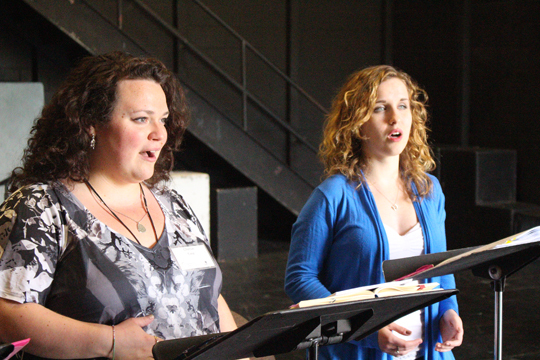 The Janus Vocal Arts Workshops offer professional development seminars and workshops in voice. In addition to the Emerging Artist track that studies and performs an opera, there is a High School Student track (July 10-14) which focuses on vocal technique and musical theatre. The two seminars — “Mind, Body, Voice” (July 7-8) and “Music as a Business” (July 12-13) — can be taken separately or together at a discount. Registration, cost and discount information available online at utoledo.edu/al/svpa/music/communitymusic/janusvocalarts. 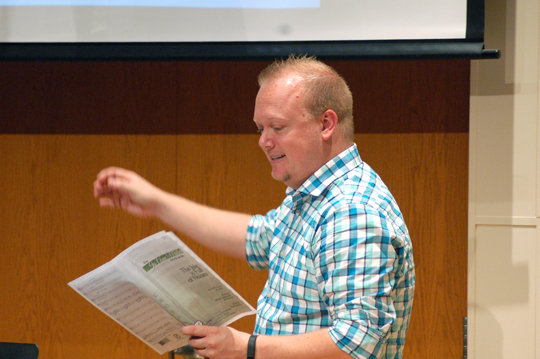 This comprehensive and immersive choral conducting workshop is intended to serve and educate individuals as conductor, teacher, leader, scholar, performer and servant. Conductors will engage in sessions covering a wide variety of topics. This year’s workshop will allow conductors to choose from either a three-day immersion workshop or a one-day workshop. Teachers: This workshop will provide up to 18 contact hours of professional development. There will be a limit of 15 spaces so that each conductor is allowed sufficient podium/conducting time. Coffee and a light breakfast will be provided in the morning. The three-day workshop is $300 if registered by July 1; $325 if registered after July 1. The one-day workshop is $100 if registered by July 1; $125 if registered after July 1. All sessions will be from from 9 a.m. to 5 p.m., with a break for lunch (not provided). Registration is open for the 18th Annual John W. Stoepler Memorial Scholarship Golf Outing, which will be held Friday, June 9. The outing will take place at the Belmont Country Club 29601 Bates Road, Perrysburg. All proceeds from the event go to a scholarship fund that benefits students in the UT College of Law. Registration for lunch, dinner and golf starts at $155 per person or $620 for a foursome. Tickets for $40 also are available for those who wish to attend the program for dinner only. Teams and individual golfers may register here. For more information, contact Ansley Abrams-Frederick at 419.530.4316 or ansley.abrams@utoledo.edu. The SpecuLIFT Team claimed the $10,000 prize last month in the seventh annual UT College of Business and Innovation’s Business Innovation Competition. The award will help the team develop its idea into a successful business. 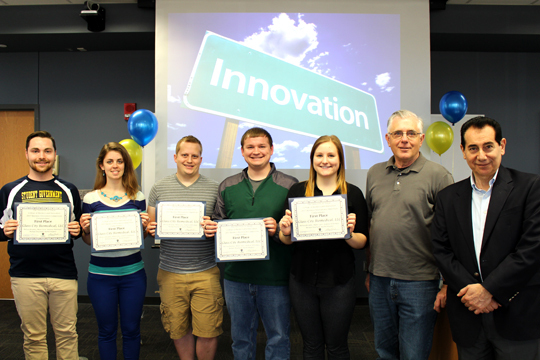 Winning the College of Business and Innovation’s Business Innovation Competition and $10,000 were members of the SpecuLIFT Team, from left, Michael Peachock, Rachel Wagner, Andrew Oehrtman, Mark Caris, Melissa Brodsky, and Dr. Ronald Fournier, professor of bioengineering and team adviser. The team posed for a photo with Dr. Sonny Ariss, professor and chair of the Department of Management. The winning team — Michael Peachock, Rachel Wagner, Andrew Oehrtman, Mark Caris and Melissa Brodsky — all met in the College of Engineering, are all bioengineering majors, and have remained close friends through their shared five-year educational journey. Their competition idea submission, developed for their engineering senior design project, was for a Novel Vaginal Speculum, a medical diagnostic device for which they are pursuing a patent. Finishing in second place was Green Agrothermal LLC, submitted by Mohammadmatin Hanifzadeh and Dr. Dong Shik Kim, associate professor of chemical and environmental engineering, who received the $5,000 prize to develop their business. Honorable mention went to RowBot, submitted by Jeffrey Darah and Andrew Puppos. The College of Business and Innovation’s business plan competition received 31 entries this year and was open to all UT faculty, staff and students. 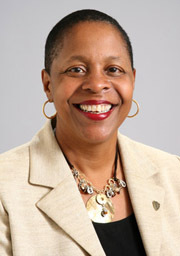 A retirement reception for Dr. Kaye M. Patten, senior vice president of student affairs at The University of Toledo, will be held Thursday, June 1, from 4 to 5:30 p.m. in the Driscoll Alumni Center Schmakel Room. Patten will retire in June after more than a decade at the University. Dr. Phillip “Flapp” Cockrell, associate vice president for student affairs and dean of students, will serve as interim vice president of student affairs effective June 1. The UT Department of Art will offer two summer workshops for students ages 9 through high school. From Monday through Friday, June 5-9, Manga/Anime will be held in the morning, and Wizard School will take place in the afternoon. In the morning workshop, students will explore manga and anime design techniques across a range of media — hand-painted shoes, digital design, hats and more. Participants should bring a pair of new, white canvas tennis shoes; all other materials are provided. 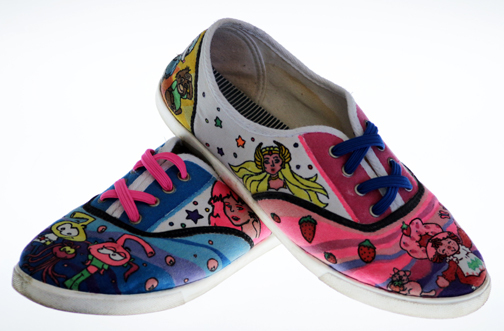 Students in the Manga/Anime workshop will create hand-painted tennis shoes. When students graduate from Wizard School, they’ll be equipped to unleash their creative inner wizard. Participants will make a wand; design a wizardry crest; concoct potion bottles; build a dark forest terrarium; create a plush creature; and develop and play wizard games. All materials will be provided. Alissa Cox, an independent artist since 2006, will present the workshops. Coming from a family of artisans and artists, Cox grew up learning woodcrafts, stained glass, blacksmithing, jewelry craft, quilting and painting. She moved her business, Smoky Grove, to Ohio in 2012 and has exhibited at Columbus Winterfair, the Great Lakes Jazz Festival and the Black Swamp Arts Festival. Cox has taught several workshops in pyrography, sewing and painting. The cost is $60 per workshop or $105 to take both workshops. Both workshops will be held in the Center for the Visual Arts on the University’s Toledo Museum of Art Campus. To register, go to utoledo.edu/al/svpa/art/webforms/summerartworkshopsregform.html.